1In the bowl of a food processor, pulse the dates, pecans, almonds, butter, cinnamon and salt until well blended and sticky; alternatively, chop the dates and pecans finely, then mix with the ground almonds, butter, cinnamon and salt until you have a mixture that will hold together when squeezed in your fingers. Press into the bottom of a 9-inch pan. 2In a medium bowl, beat the Mascarpone, cream, honey and vanilla until creamy and smooth; spread over the base. 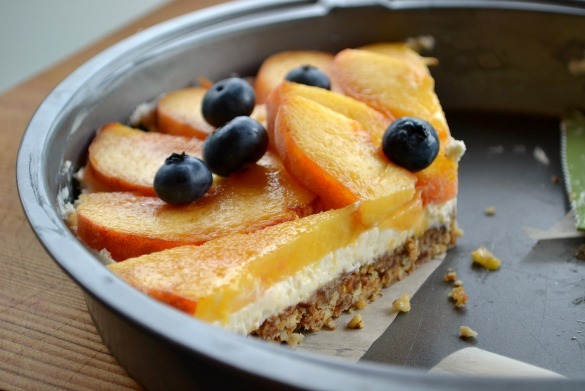 Top with sliced peaches and a handful of berries, and chill for half an hour or so if you have time - otherwise it can be served immediately.